Do you have any big lifetime bucket list items? I’ve got a few. One of these bucket list goals is to go to all 50 states by the time I am 50. I set this goal in college, after a friend had a goal of all 50 states by the time she was 30 (and she met the goal!). Growing up in a family that didn’t travel a lot, 50 states by 30 felt overly ambitious, but 50 by 50 seemed quite doable. Note: My only qualification on what counts as a state visit is that airport layovers don’t count. A few years ago, I took a trip to South Carolina for a conference with my mom. One new state, check! As we planned the trip, it turned out that airline ticket prices meant that it would be cheaper to stay an extra day, even including added hotel and meal costs. With an entire day free, the only question was what to do with that time. 1. Consider all the options, both obvious and less obvious. 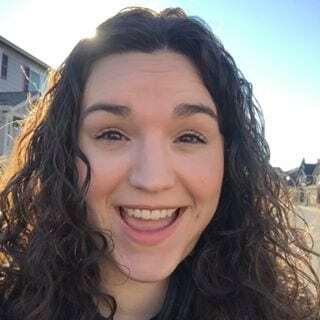 In this case, the two big options were to either taking a road trip to visit a few more states in pursuit of my bucket list goal, or see if we could meet up with a colleague for a few hours. At the time, I was freelancing virtually and one of the women I worked with lived only a few hours from the conference, and it was geographically possible to meet up for a few hours. Alternately, we could have stayed in Greenville longer and did some more local sightseeing, or taken a day to lounge at the hotel and sleep. Considering my kids were 3 and 1 at the time, sleep was tempting! Related: Is the goal clear? 2. 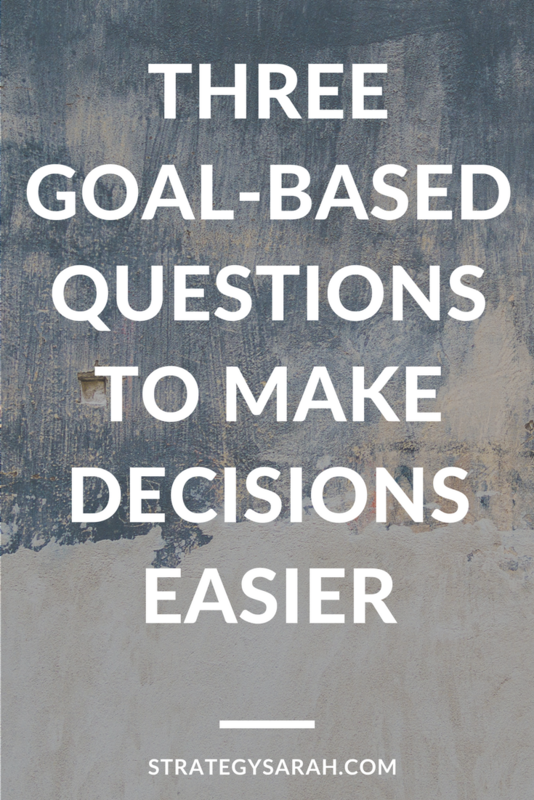 How does each option fit the big goal? If one is an obvious choice, go for it! In this case, while sleep was tempting, the opportunity to do something I couldn’t do at home won out. The consideration between traveling and meeting my colleague was a tough one. Traveling was the obvious bucket-list goal choice, but what about professional and relationship goals? Those are much fuzzier to quantify, but also incredibly important to me. The road trip was the easier option, but was it the right one? The next question made the call. 3. What extenuating factors may influence your decision? In this case, my introverted self had just spent three days meeting a whole lot of new people and I was tapped out. While I would have loved to meet my friend in person, the road trip was a better fit for my mental capacity at that specific point in time. I made the decision to go for the road trip and see a few extra states in pursuit of my big goal. In addition to the state we were staying in, we hit three extra states in one day. States are so much closer together on the east coast! In this instance, priorities meant that I picked traveling over seeing more people, and seeing quantity over quality and depth in any one area. 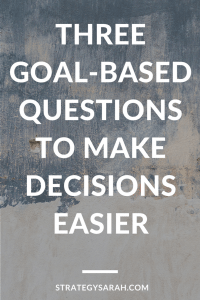 If you faced the exact same scenario, asking the same three questions above may end up with a different answer based on your priorities and extenuating circumstances. There is no right or wrong answer. By considering these questions, you can move forward with intentionality knowing that you are making conscious choices. When you make conscious choices with goals in mind, you exponentially increase your chance of reaching those goals! For the curious: I’ve got 13 years left to get to 10 more states. 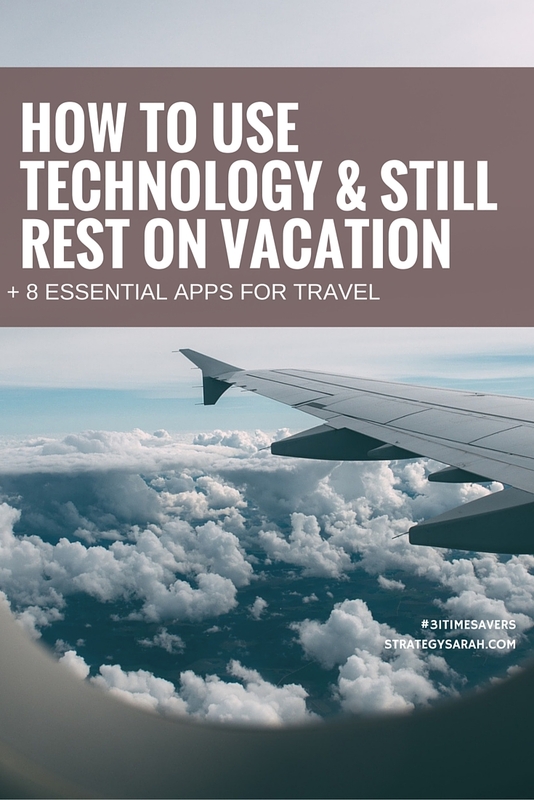 A totally crazy tip to truly rest while on vacation: Delete any and all social media and email apps from your phone. Delete anything else that isn’t directly relevant to enjoying your vacation. Secret: All those apps are in your account. You can re-download them when you get home with no issue. But Sarah, why not just shut the phone off? Depending on the vacation, shutting the phone off entirely may be a great way to go. 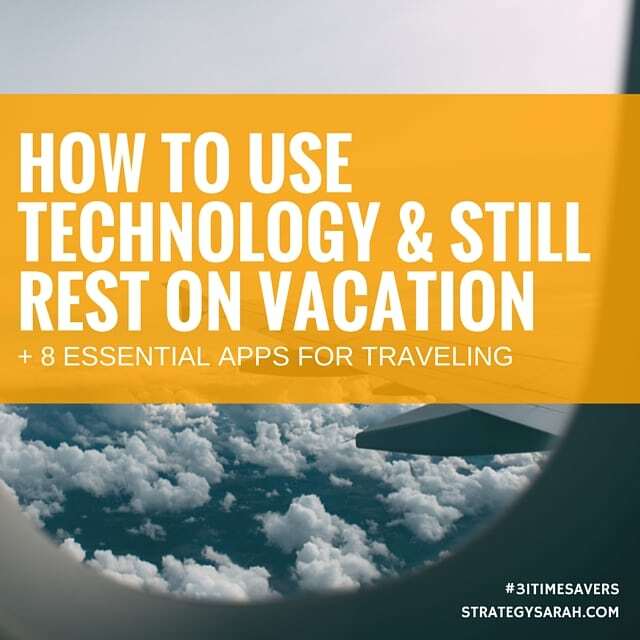 For others, keeping the phone on can save time and make the vacation more enjoyable – without being tied to your phone for typical daily notifications. On our most recent vacation, I used my phone a considerable amount, but not for anything that was draining to me (just the battery, haha). We were in the greater Los Angeles area and had a general idea of what we were doing or where we were going. Evernote or another Notes App – where you have lists of all the places to go and things to do stored ahead of time. Transit App – A friend just told me about this one – I haven’t used it yet, but have heard it’s amazing. It will show all types of public transportation and the best way to get where you want to go. Best Parking – This one shows parking lots and garages nearby, whether or not they’re open and current rates. I use this one in my own city when I need to park in areas I’m not super familiar with. Kindle / Oyster – For obvious recreational reading purposes. A relevant airline-specific app. Fly Delta was great for checking in and keeping up to date on our flight status. As a bonus, I had limited wi-fi access, so the temptation to download apps I was missing was much much lower than it would have been. There was one time I caved and logged onto Facebook from a mobile browser, but overall did that was pretty good. 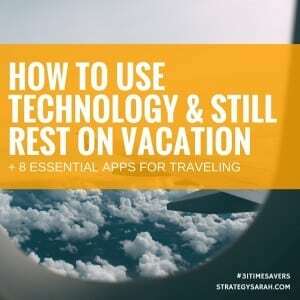 Have you had success shutting off your phone on vacation? 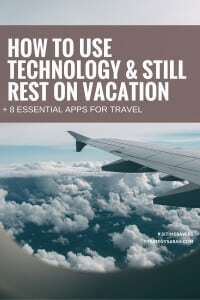 Or have any additional apps that are essential while traveling? This post is part of 31 Timesaving Tools, Tips & Templates, read the rest of the series here. When I was younger (and more cynical), I used to think it was pointless to pay attention to any of the safety protocol at the beginning of a flight. After all, if the plane went down, we’d all be dead, so what’s the benefit in knowing safety protocol? It felt more like an exercise in making naive passengers feel better, not actually a benefit. Do not take anything with you as you exit the plane. Note: This means leave your bags. Um, in this day and age that’s a problem. I don’t know about you, but my wallet used to always be stowed safely in my bag under the seat (or worse, in an overhead compartment). And I don’t have too many phone numbers memorized. My husband’s yes, but I don’t even have my own mother’s cell phone number memorized. That’s why we have smartphones, right?! What if my plane did have a minor crash? We would deplane, and I wouldn’t have ID, money or a way to get ahold of anyone. Yikes! When traveling by airplane, I always keep my photo id, a credit card and my phone in a pocket. Yes, my friends, colleagues and even family make fun of me. But it makes me feel a whole lot better. If you don’t have pockets, I found a great alternative take on the fanny pack. Side note: Why is it that maternity clothes rarely have pockets? When I was pregnant (which I’m not currently! ), I didn’t magically lose my need for pockets. Enter your email address below to get The Ultimate Evernote Packing List. Adjust to suit your needs. Sign up below and get an exclusive link to all current and future Evernote templates, for FREE! Success! Check your inbox for a link to access the FREE Evernote template library. 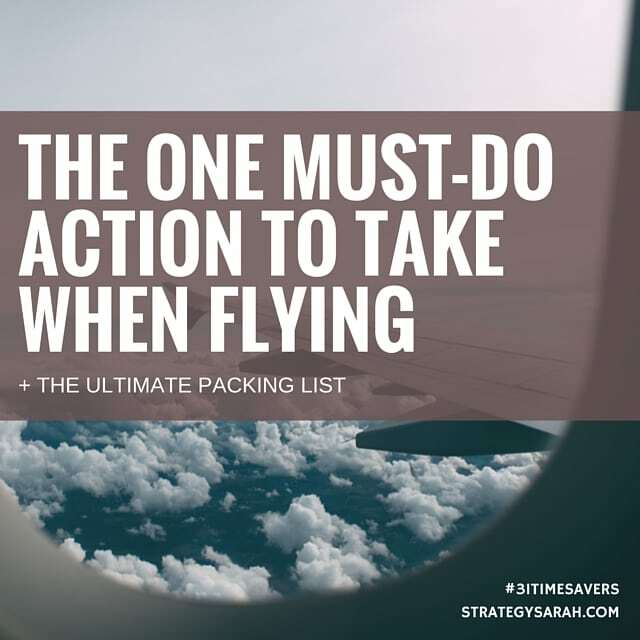 Bonus tip: Review your packing list immediately after each trip. Add anything you wished you had packed or forgot. Remove anything that’s no longer relevant. You’ll thank yourself when you’re packing for your next trip.